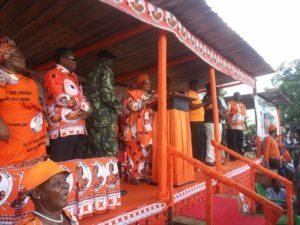 Former President and Peoples Party (PP) leader Dr Joyce Banda on Tuesday told thousands of supporters who attended the rally she held at Traditional Authority (T/A) Mlilima’s area in Chikwawa that her choice of former chief executive officer for the grain marketer Agricultural development marketing corporation (ADMARC) Dr Jerry Jana as her running mate was made after thorough consultations..
Band’s remarks come after she had earlier on told the British Broadcasting Corporation (BBC) that she would not compete in the forth coming elections giving way to UTM party leader Dr Saulos Clause Chilima in an electoral alliance between her PP and the UTM before she pulled out four days later. JB said: “I would like to start first by introducing my running mate to you, Dr Jerry Jana. I can challenge that of all the running mates, he is the best running mate ever,”. Dr Jana’s first degree is in forestry management and then he did Masters degree in Business Management and went further to do Phd in management and he once headed the Malawi Chambers of Commerce and Industry (MCCI). He was also Malawian ambassador to the European Union (EU). “Therefore, I did not just wake up and name him my running mate for the sake of it as I know that running a country is a very serious business,” Banda said. The former president said she intends to a achieve this by protecting the informal business sector in the country by reviewing taxes that are impeding small scale businesses. JB also said she shall raise the current minimum wage to MK40 000. The former President further said she has already set aside money totalling about 10 billion kwacha which shall be given as loans to small scale businesses. She also said her government shall increase electricity generation in the country to 3000 megawatts to boost the manufacturing industry. The former president said she intends to continue her ‘Mudzi Transformation Project’ by creating what she called smart villages. 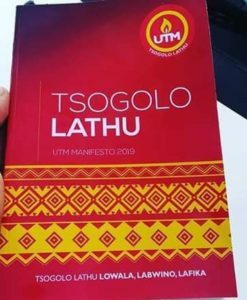 She said she shall make sure that at each village there shall be a health center, school and that in each village there shall be solar electricity. Dr Banda added that her second regime shall revamp the agricultural sector in the country by giving out universal fertiliser subsidies and ensuring that there are enough markets for agricultural commodities. Chikwawa rally was the second public appearance for the former president after a fall out of an electoral Alliance between her PP and the UTM party.